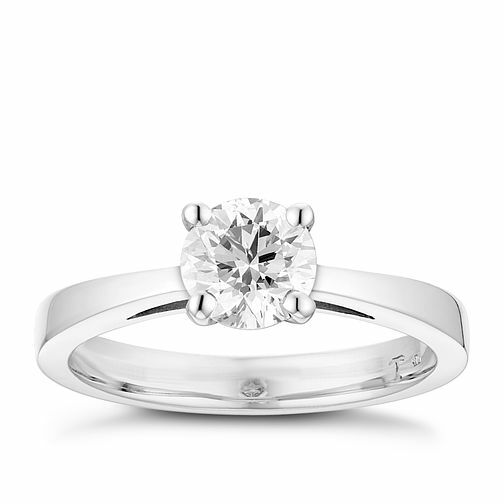 Tolkowsky platinum 1ct diamond solitaire ring, combined with a rare clarity and colour of HI VS2. Each Tolkowsky diamond comes with a gemological certificate. Browse our diamond buyer's guide for more information on diamond quality. Tolkowsky platinum 1ct HI-VS2 diamond ring is rated 5.0 out of 5 by 3. Rated 5 out of 5 by Anonymous from beautiful engagment ring!!! listen up men if you want the perfect ring for your fiancee then this is the ring i feel in love with it the moment my fiancee opened up the box has an amazing glimmer and shine to it and looks stunning on any ones finger so worth the money!! had so many compliments about it and only had it on for 3 days totally the ring to have uncomplicated and totally flawless this ring will match your fiancee smile for sure its matched mine!!! truly an amazing ring! !